The Battle of Trenton was a battle which took place on December 26, 1776, during the American Revolutionary War, after Washington's crossing of the Delaware River. General George Washington led the main Continental Army across the river to surprise and virtually eliminate the Hessian garrison at Trenton, New Jersey. This overwhelming victory established the American presence in New Jersey, helped to preserve the Continental Army, and set the stage for the Americans' success at the Battle of Princeton and second Battle of Trenton the following week. Trenton was occupied by three regiments of Hessian soldiers commanded by Colonel Johann Rall for a total of about 1,400 men. Washington's force of about 2,400 attacked in two columns from the north. Major General Nathanael Greene's division from the inland Pennington Road, and Major General John Sullivan's division marched along the River Road. General Ewing's division, Washington planned, would attack from the west but Ewing was halted by river ice (though he defended and prevented Rall's escape to the west). A third division commanded by Colonel John Cadwallader was unable to cross also due to river ice, but was supposed to attack from the south. Cadwallader crossed the next day and interrupted the Hessian retreat to the south, capturing many. Washington expected Cadwallader to be supported by Colonel Samuel Griffin, who had been sent to Philadelphia to raise a militia. Griffin had been successful with his initial mission but crossed the Delaware River further south ahead of schedule and was halted by British forces at Cherry Hill, nearly removing the element of surprise upon which Washington was counting. It is said that the Hessians were sleeping after celebrating Christmas, and they were not prepared for battle. This is not true. The weather, a severe Northeaster by all accounts, muffled the sounds of the approaching continental forces. The American victory was aided by John Honeyman, a spy enlisted by Washington, who gathered intelligence in Trenton and misled the Hessian defenders. He was responsible for estimating the strength of the Hessian defenders and for convincing them that the Americans were confused and in no condition to attack. Also, the weather appeared to make crossing of the Delaware next to impossible, further enhancing the element of surprise. The Hessians sent out a patrol every night to check for nearby enemy forces, but they were not sent out that night because of the storm. Delayed by a Northeaster snow storm which began at 11 a.m. on December 25, Washington's Delaware crossing was slowed by almost six hours. Due to the severe elements of snow, sleet, gusting wind, and even hail by many reports, the American troops were unable to reach the east bank of the Delaware River, nine miles north of Trenton, until 4:00 a.m. on December 26. Washington had planned his rendezvous with Ewing and Cadwallader for 5 a.m. With the storm still raging, fighting began around 8:00 a.m. and was over by 9 a.m.
Trenton had two main streets in 1776, King (now Warren) Street and Queen (now Broad) Street. Rall had been ordered to build a redoubt at the head of these two streets (where the battle monument stands today) by his superior, Count Carl von Donop, whose own brigade was stationed in Bordentown. Von Donop was not in Bordentown. He had marched south to Mount Holly on the 22nd to deal with the South Jersey Rising, and clashed with Samuel Giffin's New Jersey militia there on the 23rd. An officer of the Hessian engineers, Captain Pauli, was sent to Trenton with those orders, and then was sent back by Rall, without building the redoubt. When Rall was warned that the Patriots might attack, he replied, "Let them come. We need no trenches. We will go at them with the bayonet." A small guard post was set up by the Hessians in Pennington about nine miles north of Trenton, along Washington's route to the city. When the squad guarding this post saw the large American force on the march, Lieutenant Wiederhold, in command of this Pennington picket, made an organized retreat. Once in Trenton, the picket began to receive support from other Hessian guard companies on the outskirts of the town. Another guard company nearer to the Delaware River rushed east to their aid, leaving open the River Road into Trenton. General John Sullivan, leading the southern American column entered Trenton by this route and made it hard for the only crossing over the Assunpink Creek, which was the only way out of Trenton to the south, in hopes of cutting off the Hessian escape. When the 35 Hessian Jägers, under the command of Lieutenant Grothausen, stationed at the barracks on the northern edge of the town saw the vanguard of Sullivan's forces charging into Trenton, they ran over the Assunpink bridge and left Trenton. Slowly, various companies of the three defending regiments formed and entered battle. Lieutenant Biel, Rall's brigade adjutant, finally awoke his commander, who found that the rebels had taken the "V" of the major streets of the town where earlier that month Pauli would have constructed the redoubt. The northern American column led by General Nathaniel Greene quickly took this position, and with their cannons denied the Hessians a chance to form in the streets, while the remaining men in the column, and the other column with Sullivan nearer the river, moved to surround the Hessians. Rall led his men and the men of the Lossberg regiment, under Lt. Col. Scheffer, out of the town and attempted to reorganize and retake the town. The Americans, by this time, occupied the majority of the buildings and from cover, fired into the ranks of the Rall regiment. The regiment broke and routed back through the ranks of the Lossberg regiment, causing more chaos. The two regiments were surrounded in an orchard south of the town, and from the smoke came the drums and standards playing the parley. Rall could be seen slumped over in his saddle; he was mortally wounded. At the Assunpink Creek, the Knyphausen regiment, under Lt Col. von Dechow, became cut off from the bridge and was surrounded. The regiment surrendered just minutes before the rest of the brigade. The American forces had suffered only a handful of wounded, although two men died of hypothermia on the march, and more the next night, while the Hessians suffered 114 casualties with at least 23 dead, as well as 913 captured. Rall, who had been mortally wounded, died the same day. All four Hessian colonels in Trenton were killed in the battle. The Lossberg regiment was effectively removed from the British forces. Parts of the Knyphausen regiment escaped to the south, but Sullivan, aided by Cadwallader, captured some 200 men along with the regiment's cannons and supplies. By noon, Washington's force had moved to recross the Delaware back into Pennsylvania, taking their prisoners and captured supplies with them. This victory gave the Continental Congress and the American colonials re-newed confidence. It proved American forces could defeat not only British regulars but Hessian mercenaries as well. It also increased the re-enlistments in the Continental Army forces. The Americans had now proved themselves against a disciplined European army and the fear the Hessians inspired earlier that year in New York was broken. Captain Johann Ewald (of the Jägers), who was with von Donop in Mt Holly at the time of the attack, said of the Americans later, "We must now give them the honor of fortifications." While only two Americans were wounded, both of the injuries occurred during the Americans' rush to capture Hessian artillery, to prevent the guns from being used. These wounded were officers: Captain William Washington (the General's cousin), who was badly wounded in both hands, and young Lieutenant James Monroe, the future President of the United States. Monroe was carried from the field bleeding badly after he was struck in the left shoulder by a musket ball, which severed an artery. Doctor John Riker clamped the artery, keeping him from bleeding to death. The hours before the battle served as the inspiration for the famous painting Washington Crossing the Delaware. The image in the painting, in which Washington stands majestically in his boat as it is crossing the Delaware River, is more symbolic than historically accurate, since the waters of the river were icy and treacherous, and the flag James Monroe holds was not created until six months after the battle. The crossing also occurred before dawn. Many have doubted that Washington stood, but many scholars believe they all stood, but in a different type of boat. Nonetheless, the image has become an icon of American history. 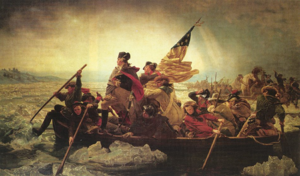 History of "Battle of Trenton"
This page was last modified on 8 January 2013, at 16:32.